Discover all that Downtown Philadelphia has to offer at the convenient, clean and comfortable Holiday Inn Express Midtown Philadelphia. In the heart of Center City, you will have access to shopping, dining, entertainment and the arts. Holiday Inn Express Philadelphia Midtown is within walking distance to various historic sites including: Independence Hall, the Liberty Bell and the Betsy Ross House. 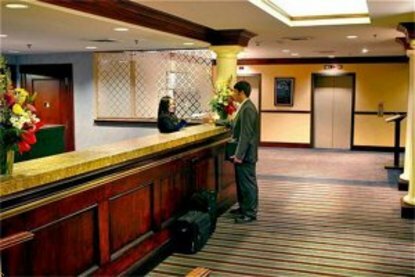 Our hotel is convenient to many other attractions including the Pennsylvania Convention Center, the Avenue of the Arts, Philadelphia's Restaurant Row, Penn's Landing, Philadelphia Zoo and Museum area. A short subway ride away are professional sports venues: Lincoln Financial Field, Wachovia Center, and Citizens Ball park. Getting there is fast and convenient. Easy access to all major highways and only 8 miles from the Philadelphia International Airport, you&regll spend less time in traffic and more time doing what you came to Philadelphia to do. Whether you&regre coming to Philadelphia for business or pleasure, rest assured your room at the Holiday Inn Express Midtown Philadelphia is your personal retreat. Relax and make the most of your day. Amenities such as free High-Speed Wireless Internet throughout the hotel, Complimentary Hot Breakfast Bar, Outdoor Pool, 32&reg LCD/HD TV&regs and comfortable bedding means every night is a great night and every day starts right. This hotel is committed to providing accessible facilities under the American Disabilities Act. If your accessibility needs are not met, please contact the Hotel Manager on Duty. Should you require additional information regarding accessible facilities for guests with disabilities, please call 1-800-Holiday (U.S. and Canada) or contact the hotel directly. For the hearing impaired, TDD service is available at 1-800-238-5544 within the U.S. and Canada.